Another from the magnificent Magnolia Gardens in the Charleston Area. This scene was found by Dan at the end of a long day in the Gardens. We had a nice group gathered in this location and so we all took turns. Great image to study! Wonderful color, spot-on placement of the trees, the azalea in the lower left anchors the scene on that side, and the azalea on the right side which curves to the left anchors that side. All in a tight, yet airy, landscape composition. Beautiful scene. I love the soft feel of the Spanish Moss. I agree with Mike. Great composition. I wish I were there. I like the overall softness of the image. 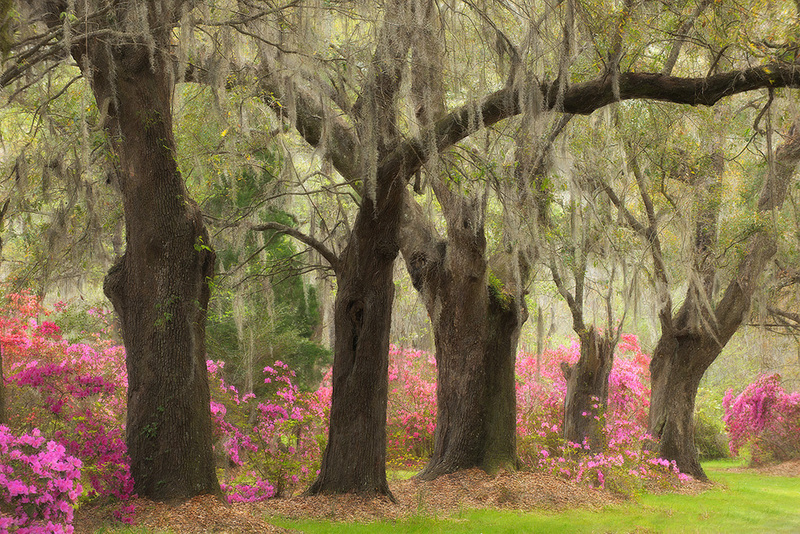 The soft and bright colors of the azaleas complement the softness of the Spanish Moss covered trees. I have been enjoying these images you took of the gardens, absolutely beautifully done. Can’t wait to see more.